The recipe given below is simple enough for an idle 10 year old if you are lucky enough to have one handy. It is adapted from Elizabeth David’s recipe for Pancake Batter, given in “Summer Cooking”. 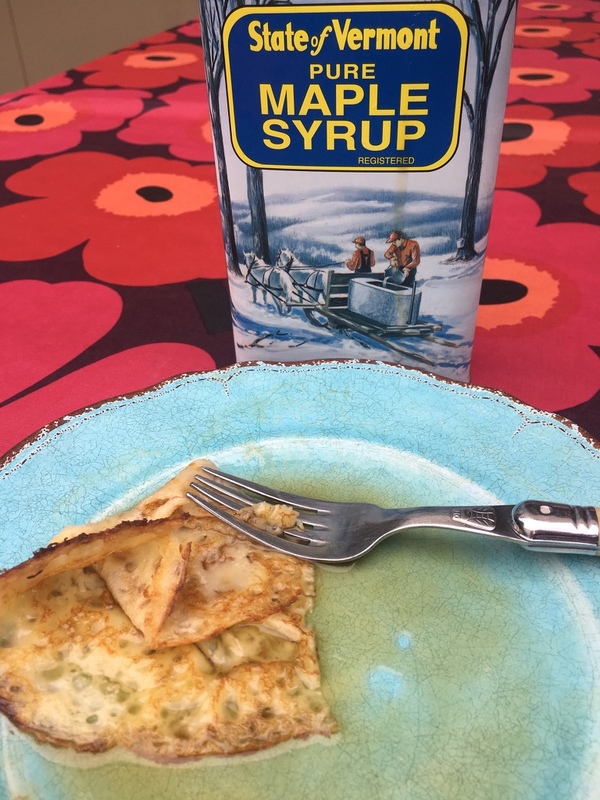 The combination of full cream milk, water and the curious addition of olive oil creates the loveliest, laciest pancakes that you can imagine. Make the mixture a few hours in advance, cover and refrigerate before using. I store it in a jug for easy pouring into the pan. The quantities given are easily doubled and allow for the occasional pancake for breakfast too. This article is an adaptation of one published in the King’s Tribune in June 2012 – Titled Simple Pleasures – Pancakes and Strawberry Jam. Growing up in a large family, Tea on Sunday was a light and casual affair that followed the extravagances of Sunday Lunch. In those days we were all keen on getting a meal out of the way to settle down in front of the weekly family movie screened on “Disneyland”. How my mother must have groaned that anyone wanted anything to eat at all. Pancakes were often the Bill of Fare for the evening. They remain on our menu all of these decades later. A family favourite for a lazy Sunday evening and the perfect tonic for the excesses of the weekend. Pancakes create a minimum of mess and need be no fuss to make. I have never understood therefore why anyone would purchase those powdered concoctions, allegedly of eggs, flour and milk that you are required to add water to and shake in the bottle. What after all is so complicated about digging out your own milk, flour and eggs and whizzing them through the blender or simply stirring them together in a bowl? I am aware that all sorts of tricks abound for setting aside cooked pancakes until you have an almighty stack of them. I encourage you though to eat these pancakes straight from the pan for maximum pleasure. Either organise for someone to take charge of the pan altogether or ask that everyone get up and cook their own. Do not be dismayed if the first pancake or two does not work out so well. I have never understood why this is so but I suspect it may have something to do with either the temperature of the pan being too low or simply a lack of confidence on the part of the cook. Be assured that they improve with each attempt. Two essential implements for making pancakes are a well balanced fry pan, ideally 15 – 20cm in diameter and a slim styled (non-perforated) spatula made of silicone or stainless steel. To prevent the pancakes from sticking to the bottom of the pan, it is critical that you gently heat the pan first and allow the fat to melt and foam before you add the batter. On that note, because clarified butter has a much higher flash point than butter, it is far superior for cooking pancakes to butter. If you cannot get hold of any clarified butter, ghee is a fine alternative. It is also important that you only half to two thirds cover the base of the pan with batter and carefully manoeuvre it to allow the liquid to spread. This ensures fine lacy pancakes. Gently lift the edges as they form, tilt the pan and allow any liquid to run into spaces created. Serves 2 – 4 or 8 – 12 pancakes, depending upon the size of your pan. 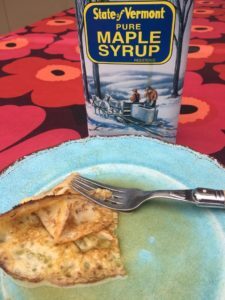 Best quality Maple Syrup from Vermont. Place the ingredients in listed order into a blender and blitz for about 1 minute. The Hygge way would be to add the flour to a mixing basin, using a wooden fork, combine the flour and the salt, work in the olive oil and the egg. Gradually stir in the milk and then the water, stirring all the time to get rid of the lumps. Pour or ladle some batter into the pan, it should initially cover about half to two thirds of the base, swirl to spread the mix evenly. Lift the edges and tilt the mixture into the space created, keep doing this until all the liquid has set. Using a fine spatula, flip the pancake to finish cooking on the other side. Place the cooked pancake on a plate, pour over maple syrup. That is it.